At least once a year, representatives of HBE make the distant journey to NE Ohio for business. 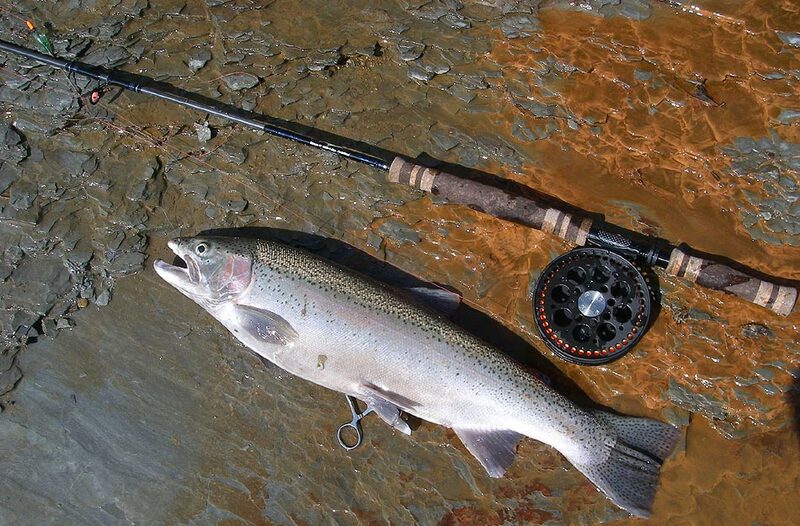 Coincidently, their travels just happen to coincide with the steelhead spawning runs. Last season, I had the pleasure of fishing with these gentlemen from Switzerland and enjoyed the thrills of watching them hook up on twin float rods that I constructed in anticipation of their visit. This year, Michael requested that I put together a switchrod for him that would serve as a two hander and as a centre-pin float rod. Knowing that I enjoy building these types of rods, it was my pleasure! To begin we needed a theme. He suggested black, blue, and a stealthy appearance. 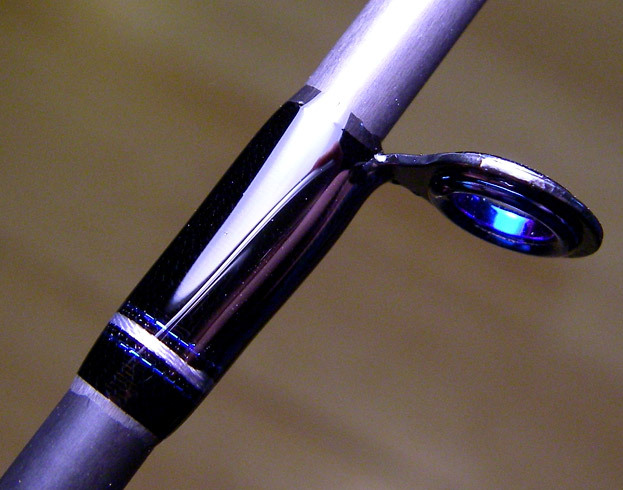 Stealth seems to be quite popular these days, but the need to have each rod unique in style is difficult to maintain. My thoughts usually begin with the grips. A concerted effort is made to remain tasteful, unique and "cool" with the appearance. When given the "green light" to do what I "do" sometimes the boundaries can be stretched (if only a little) from what the client has initially specified for the build. 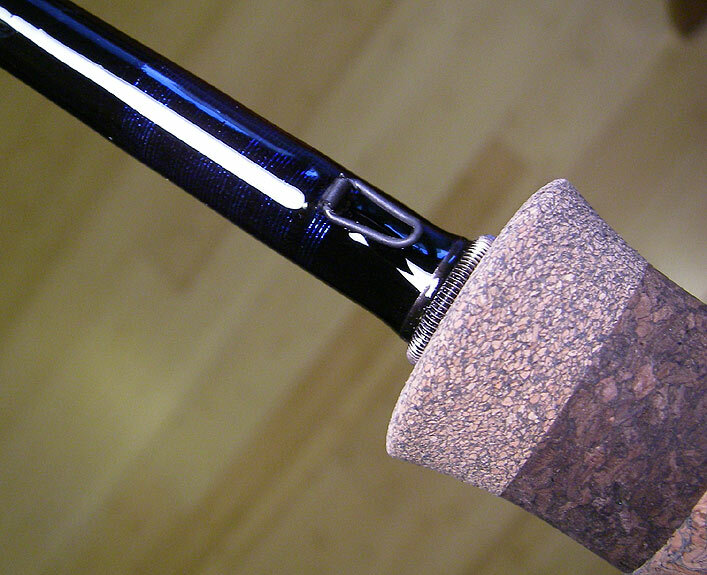 Incorporating burnt exotic cork in the handle really set the tone for this rod. I shaped using a popular template for switch rod handles (many thanks to Bob Meiser and his website) and emailed a photograph off for an OK. Michael and I agreed that a bit more shaping was required on the aft grip. A short while later and an ever so slight tweaking with sandpaper and the end result is perfection. Michael had also indicated that he really like the Halo/Tiger Wraps that he had seen in the photo gallery. I knew just the spot to put them, flanking the underwrap of the rod specifications / steelhead decal. Finally, he shot me a few preliminary MS paint illustrations of the color scheme in the wraps he would like to see used. They gave me the base of what I chose to "amp" up a few levels. 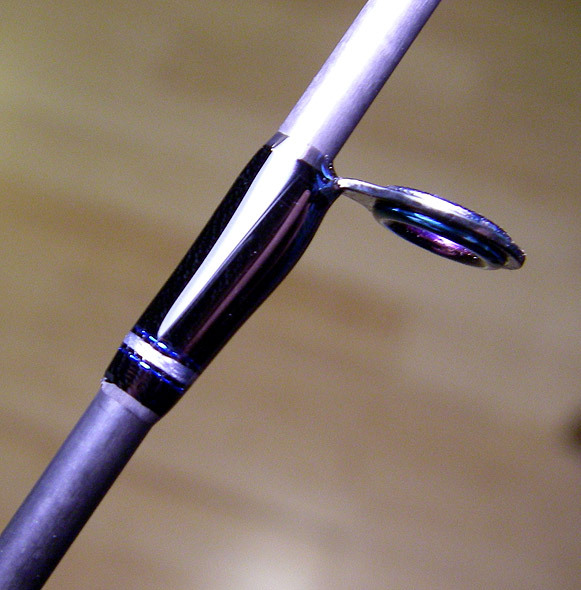 The spiral wraps in blue, trimbands in blue and grey and the black metallic base color really set this rod apart from the "cookie-cutter" OEM rods that line the walls of just about every fly shop. I can't wait to fish it, I mean....watch him fish it and hook some chrome! Blank: Batson IF1088-4 Switchrod 8wt. This a really fun project! I think I'm most excited about getting out to fish with these guys again and seeing how the rod performs under the stress of a steelhead tug-o-war. These Batson blanks are an excellent value and offer great versatility. The 5wt. 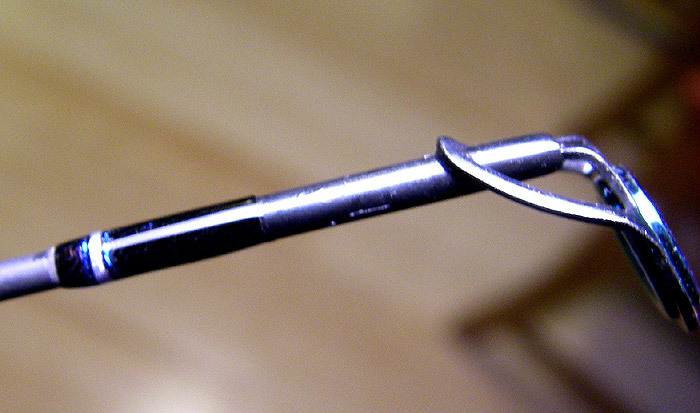 version is an great option for a small trout pin rod or summer smallmouth/catfish rod that breaks down into a compact unit. What I suspected with the initial build on these blanks has come to fruition. It is obvious that many of the client orders will somehow involve this configuration and blank.